Alaska is one of the popular summer destinations, but that doesn’t stop the state from being happening and full of activities during the season. By the end of the summer season, the locals of Alaska start preparing for the cold and dark winter. The winter days are quite short, but the people do know how to make the best of this time with a range of events and activities. 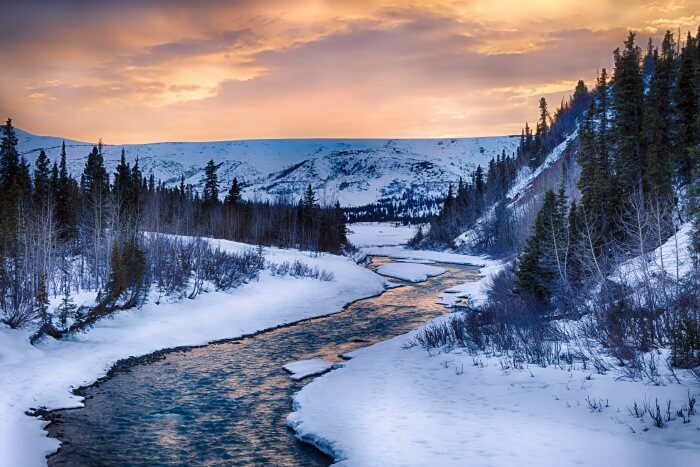 Alaska in winter is gorgeous, and you must visit it during this time. But, you definitely need to be prepared for the different kinds of activities this place has to offer. If you are clueless about it, we are going to provide you with some beautiful insights about the different things you can do during your stay in Alaska. These activities are definitely going to bring out the mysterious and wild spirit within you. If you happen to visit this gorgeous piece of land, make sure you do not miss out on any of these experiences. 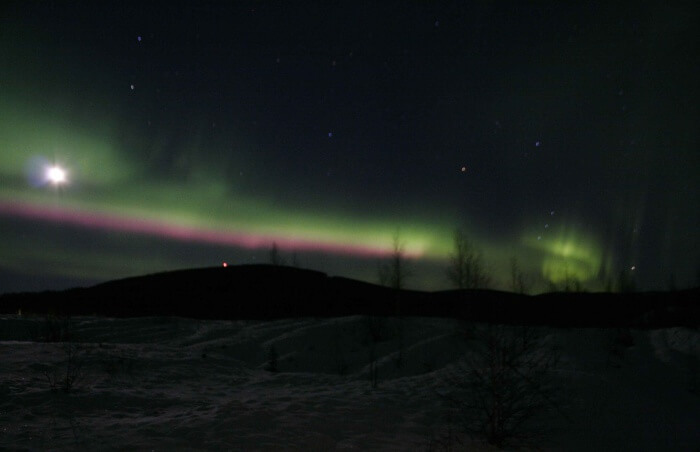 Northern lights are one of the most mystical and rare events that happen in the world. 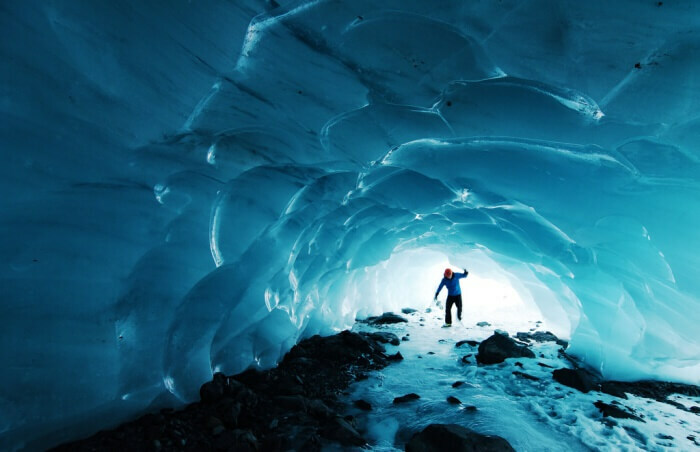 It is definitely something you wouldn’t want to miss out on during your stay in Alaska. In order to make your viewing trip a success, you need to do a lot of research. It is a view that cannot be expressed in words, and your trip would be incomplete without witnessing it. The dead Alaska weather in winter is considered to be the best time to observe this marvelous view. However, you may also get lucky during the immediate end of the summer season, usually during the September month. If you feel this experience is something you wouldn’t like to miss, you must definitely plan your trip accordingly. When it is the darkest, the northern lights are visible. Make sure that the weather is generally mild and the skies are clear when you plan for this event. Must Read: 12 Hot Springs In Alaska That You Should Visit to Unwind Your Inner Zen! No other activity could be as famous as dog mushing when it comes to Alaska. And it is all because of the abundance of snow. Alaska is also known to be the home to the famous Iditarod, and since then dog mushing has become a long tradition in Alaska. Starting from mid-October to mid-April, you will find a lot of options in dog mushing. Regardless of your age, you can have a perfect time. The moment you enter the kennel, you will get to see a group of dogs barking and running around. 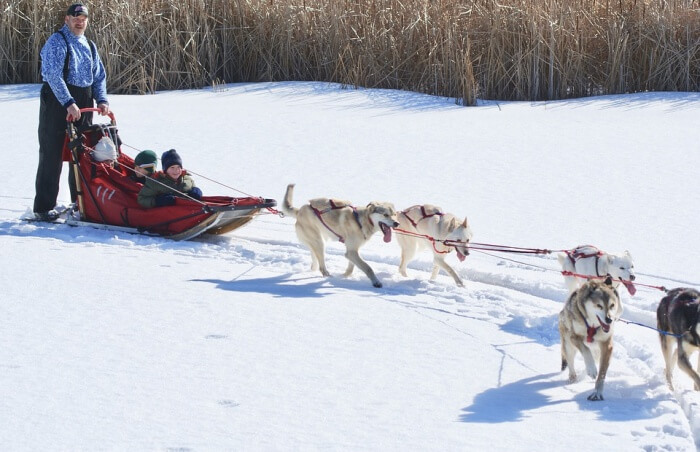 With the help of a sled, the dogs will take you on a ride in an effortless fashion. Not only will you get to experience a unique ride, but also enjoy the wilderness of Alaska. All of this is possible during Alaska in winter. If you are looking for things to do in Alaska in the winter, snowmobiling needs to be in your bucket list. Alaska is known for its wintery landscape, which makes it a playground for all tourists visiting the USA. 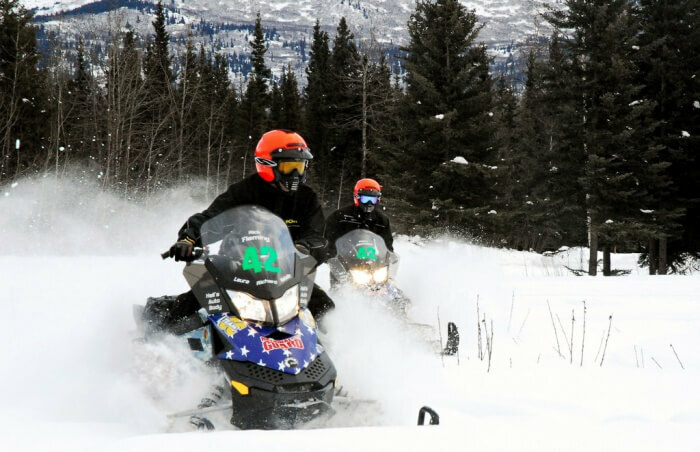 There is nothing better than exploring the backcountry while riding a snowmobile, popularly called snowmachine. 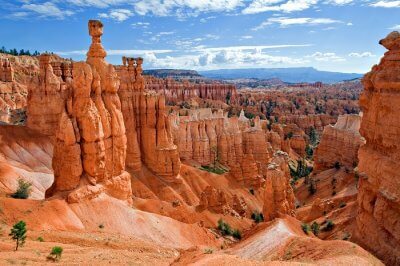 It is an exhilarating experience that takes you on a journey through the mysterious and quiet lands. You get to speed over layers of snow and make your way through the remote glaciers, hidden ice caves, and frozen rivers. If you are a fan of winter sports, you absolutely need to try this experience. If you are a couple or a group of family with older children, this activity is perfect for you. During your trip through the creeks, mountains, and glaciers, you will also get to notice the wildlife in the form of wolves, lynx, ptarmigan, and moose. Alaska in winter is definitely a time when you get to experience skiing. There are several beautiful ski destinations in the state that offer outstanding outdoor adventures. Most of the resorts also provide these services to keep the tourists engaged. Not only do you get a fantastic view of the glacier, ocean views, and mountains from your resort, but also an experience to ski in places that have an annual snowfall of up to 650 inches. 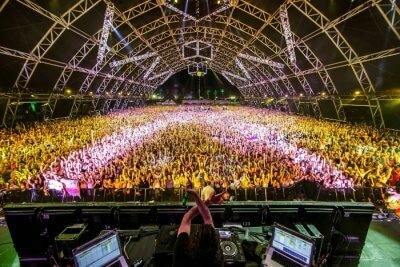 It is an experience you wouldn’t want to miss. 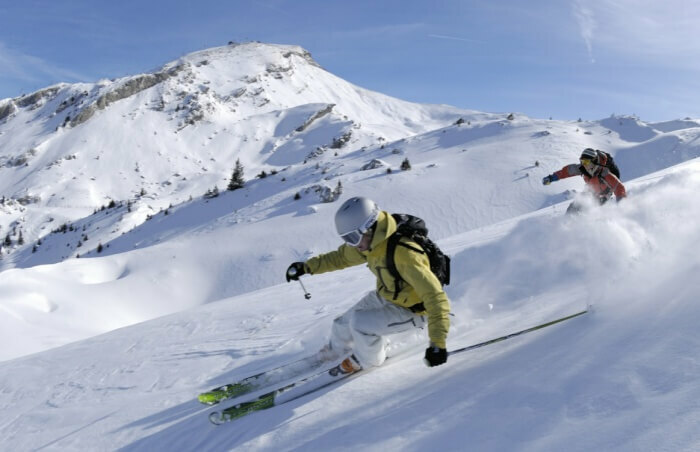 During your time, you will also get to explore the mountains and the terrain parks of the resorts. By hiring a guide, you will even get to see the most challenging outer regions. The beauty of ice skating is unique in itself. When the fresh water reserves freeze up, it offers an excellent opportunity for tourist and locals to engage in ice skating. It is a paradise for bikers, skiers, hikers, ad ice skaters. Before the snow gets deep, adventure skating can be quite a sport. Alaska in winter offers a vast land of smooth, flare ice that is like no other region in the country. Couples and families come to visit this state in order to get the incredible ice skating experience. The Eklutna Lake is also known for being one of the popular areas for ice skating. Suggested Read: Alaska With Kids: A Detailed Guide For Your Little Ones! Driving to Alaska in winter is definitely an experience of a lifetime. 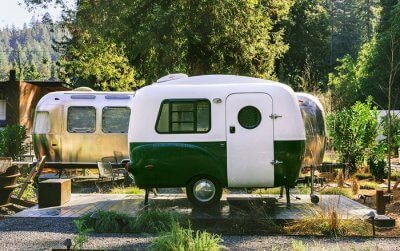 Similarly, people who love to stay on the road also have the unbelievable opportunity to go on a bike tour with the help of different trails. If you plan to explore Anchorage, it can be quite independent and affordable with the help of bikes. With a helmet, repair kit, map, free lock, and suggestions, there is nothing you cannot cover with the help of bikes. 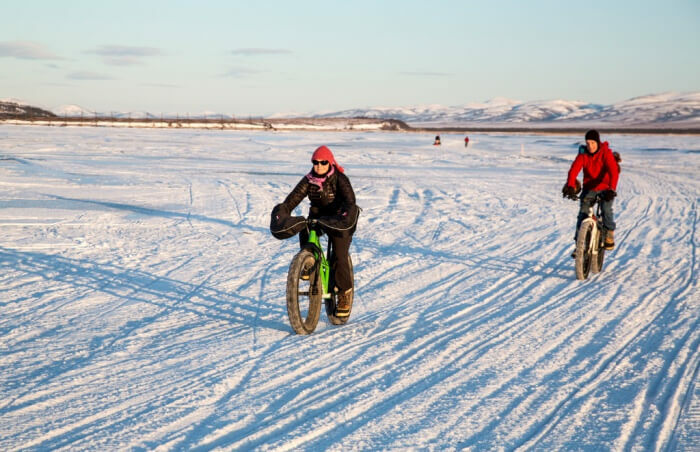 Bike tours are even more exciting when coupled with the night-time aurora experience, it is cherry on the top. Suggested Read: Shopping In Alaska: To Pamper Yourself With The Best Of Retail Therapy! Among other activities, most of the Alaska winter tours involve ice fishing as well. The fishing experience is phenomenal. You can enjoy fishing during the summer as well as winter months. However, it is a unique sport during the winter season. 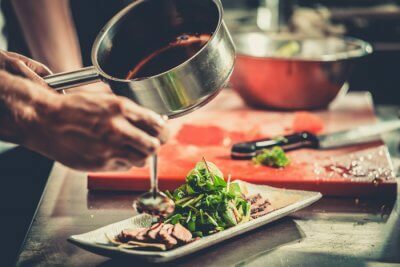 Depending on your skill level, your guide will help you out throughout the whole process. You will find a variety of fishes such as grayling, silver salmon, rainbow trout, rod, and pike. 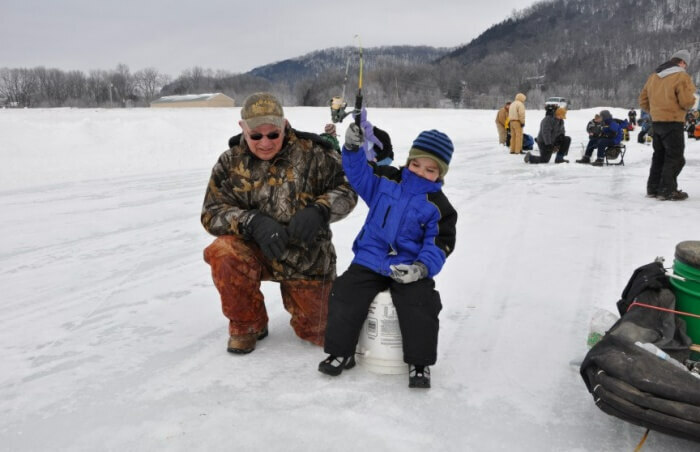 During the winter season, the thrill of fishing goes to a whole new level. Tourists are thrilled to find rainbow trout, Arctic char, king salmon, and so much more. Suggested Read: 10 Casinos In Alaska For Those Who Want To Have Some Fun In The Snowy Paradise! 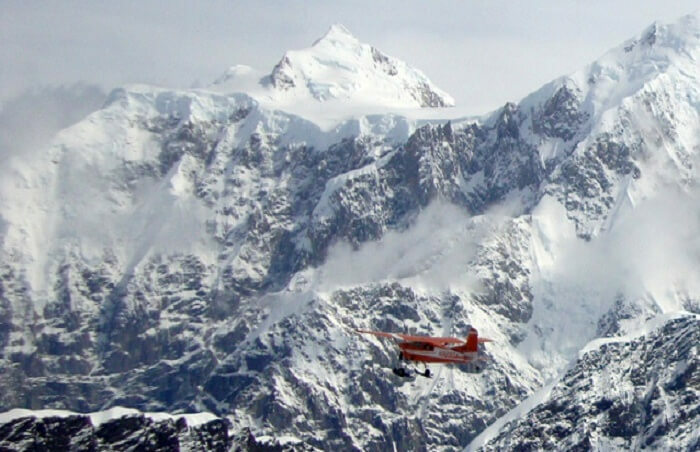 Another fantastic experience that Alaska has to offer tourists would be the flightseeing one. If you are keen on observing the Alaskan wilderness, this is the best way to go. By choosing the right service provider, you will be gifted with excellent service and comfort at the same time. Passengers are given a headset to help listen and communicate with the pilot. When it comes to safety, you have nothing to worry. 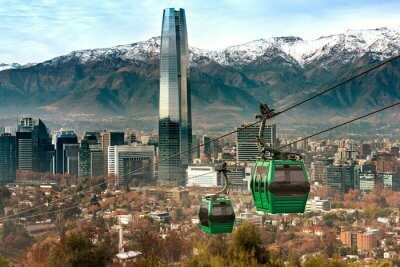 If you are afraid of heights and absolutely adore the aerial view, this experience is a must for you. In just about one hour 15 minutes, you will get to see mountains, a volcano, Fjords, and ice fields. Further Read: 10 Zoos In Alaska Which Will Give A Glimpse Of The Diverse Wildlife At This Nature’s Paradise! 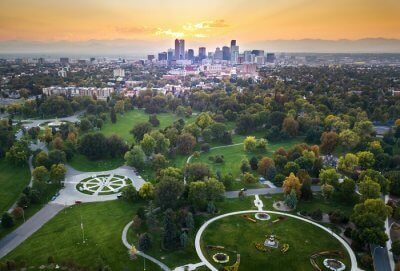 It is the world of diverse terrain and beauty such as quaint small towns, forests, mountains, exotic wildlife, and open spaces. Alaska should be the highlight of your vacation to America as it is one of the most sparsely populated and largest states. Some of the common activities in Alaska in winter that appeal tourists include kayaking, mountain biking, skiing, and so on, and should be on your must-do list.